Standing on Earth, we know, to the depths of our being, which way is up because gravity defines every action we take. On a spacecraft, any sense of direction that the crew has is artificially imposed by their personal knowledge of the cabin, its layout and their view from the windows. Beyond that, there is no up or down in space. However, to aim an engine in the correct direction and get to a destination, there must be some measurable definition of which way is which; up, down, left, right, back, forward. In fact, there were many operations on board the Apollo spacecraft that needed some sense of direction - although not the same sense in all cases. To do that, engineers had to provide a reference against which the spacecraft's current orientation was to be measured. Once again, the answer was in the stars. 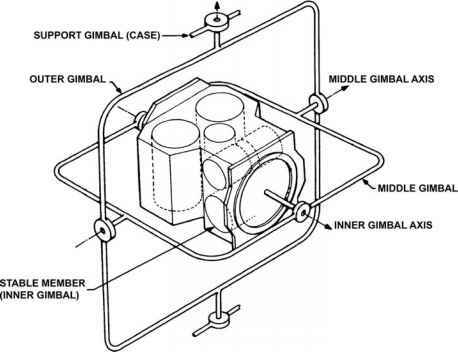 A schematic of the guidance platform and its supporting gimbals. 'fixed' reference against which progress could be metered. Apollo continued a long tradition of employing the stars for navigation. We have already seen how the angular relationship between a star and a planet could be used to pin down a spacecraft's position and velocity. The stars contributed in another essential way by helping to define direction. The magnitude of an engine burn was not only important to its success, but it had to be fired with its nozzle (and hence the spacecraft) aimed in the right direction. Correcting for any misalignment would be wasteful of precious propellant, and such misdirection could possibly jeopardise the crew. The orientation of a spacecraft in space is known as its attitude (not to be confused with altitude) and, in an Apollo spacecraft, measuring attitude was the role of the inertial measurement unit (IMU). Encased in a spherical housing a little larger than a soccer ball, the IMU consisted of three nested gimbals that supported a platform at their centre. Their arrangement isolated the platform from the spacecraft's structure. The platform carried three gyroscopes mounted orthogonally (at 90 degrees to each other). If a change in orientation was detected, the gyroscopes signalled motors to return the platform to its previous orientation. This arrangement ensured that as the spacecraft rotated this way and that, the orientation of the platform remained the same, at least for a few hours. The attitude of the spacecraft could then be measured, relative to the platform's orientation, by encoders built into the axes of the gimbals, yielding three angles that told the computer the direction in which the spacecraft was pointing. 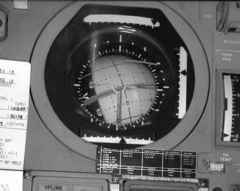 The spacecraft attitude angles were displayed to the crew using the elegant (and elegantly named) flight director/attitude indicator (FDAI) which was more usually referred to as the '8-ball'. It is best to think of this as the spacecraft's equivalent of the artificial horizon display found in the instrument panel of almost every aircraft, and its inclusion reflected the aviation background of the crews that flew Apollo. Usually, the ball at the centre of the display was driven to match the orientation of the platform. If the spacecraft rotated, it would appear to do so around the 8-ball, mimicking the way it actually rotated around the stable platform. Graduations marked on the ball's surface then allowed the crew to read their current attitude off the display as degrees of pitch, roll and yaw. Further meters and needles built into the FDAI told the crew where their ideal attitude was, and how fast they were rotating. The reason for calling it an '8-ball' was a red disk on either side of the ball. This represented a range of attitudes that the spacecraft should keep away from, which we shall discuss later. Each spacecraft had two FDAIs on its instrument panel, for redundancy. The IMU had another important function. As well as providing a reference against which the spacecraft's attitude could be determined, its stable platform also provided an excellent base for the measurement of acceleration. Mounted alongside the gyroscopes were three accelerometers that detected changes in velocity along the three axes of the platform. Measurement of acceleration allowed the computer to calculate the effect of an engine burn. If you start from a known point in space, measuring acceleration will tell you how much your velocity has changed. Knowing your velocity allows you to calculate how your position has changed, and position is an important element of the state vector. Although the state vector was periodically determined externally by the ground or the crew, the IMU's ability to measure acceleration accurately allowed the G&N system to update the state vector on an ongoing basis, especially during engine burns. In the realm of guidance and navigation, the IMU's measurements only made sense if the computer knew which way the platform was oriented in space, i.e. which way was up, and this required some kind of external fixed reference. Neither Earth nor the Moon could be used because the spacecraft was moving substantially with respect to both of these bodies. Instead, the platform's orientation was defined against a frame of reference for which the stars were the fixed points.